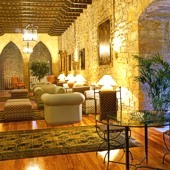 In Parador of Hondarribiayou will feel that you are back in the Middle Ages. Thick stone walls, arches, armour and spears adorn this castle which was founded in the 10th century by the king Sancho el Fuerte of Navarre in the early days of the Christian re-conquest. The defensive appearance of the thick walls conceals a magnificent interior. The immense naked stone of the courtyard stands out, as do the beautiful views of the French coast and the sea which may be enjoyed from the splendid terrace or from some of the bedrooms. Charming nooks and crannies, spaces adorned with arches, wrought iron and coffered ceilings surround the guests in an atmosphere of indescribable beauty. Lances, cannons and armour make up the interior decoration offering an air of historical elegance. Go for a stroll around the fishing neighbourhood of Hondarribia. Also visit the City Hall and the Sanctuary of Nuestra Senora de Guadalupe only 3 miles away from the Parador. The castle of San Telmo on the cape of Higuer and Mount Jaizquibel have some wonderful views that are not to be missed. The religious festival of"Semana Grande" (Grand Week) of San Sebastian starts on August 14th.The feast of Virgen de Guadalupe takes place in Hondarribia on September 8th, This feast includes a procession known as Alarde, commemorating a victory of the city over the French in 1638. There are many activities that you can carry out near here including horse riding, playing golf, mountain biking, hang gliding, jeep routes, scuba diving, sailing, surfing, canoeing, fishing, and boat trips. The Hondarribia Parador is approximately 119 kms from Bilbao and the famous Guggenheim museum, designed by the American architect Frank O. Gehry. This Parador has twenty eight twin bedded rooms, three rooms with double beds, four single bedrooms and one easy access room. All the rooms have a private bathroom and a telephone, satellite television, safe and a mini bar. There is a bar available for guests. There is heating in the Parador but no air conditioning. Facilities include currency exchange, lift, satellite television, gift shop, piped music, parking facilities (without security and limited places), garden and a conference room. Distance from the nearest airport is approximately 1 kms, train station is 3 kms away and the nearest port is 13 kms away. There is not a restaurant at this Parador but there is an independently owned restaurant 2 minutes walk away. A buffet breakfast is included in the price of the room for guests staying at the Parador. We stayed at Hondaribbia for two nights and were sad to leave. Very interesting parador and the staff, particularly Raphael was very attentive, charming and informative. As a room with a double bed became available, we changed rooms for our second night. The terraces with the view across to France was incredible and a wander down to the fishing quarter was lovely, with old, fisherman's houses painted in bright colours. We enjoyed the feria with the sheep in the square and the maze and local restaurants were very good. Can thoroughly recommend this parador as somewhere very different, but still the excellent standard of service you expect from the paradors. Had an amazing stay in October. The staff couldn't be more helpful. The breakfast was very substantial in a beautiful setting. Our room had ocean views and the town is very quaint and pretty. I actually had thought we would be in San Sebastian but so glad we discovered the town of Hondarribia. I've always wanted to experience living in a real 'century's old' castle and this Parador was wildly beyond my expectations. Absolutely magnificent feel, structure, and visuals internally and externally, with exquisite views across the inlet and boats to the ocean and French coastline. Rooms were modern, comfortable and staff wonderfully helpful. Can not speak highly enough of this place. We stayed 4 nights in late March 2015. 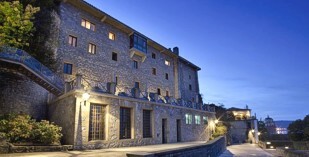 We had a wonderful stay in this atmospheric castle in the centre of the beautiful old town of Hondarribia. We were delighted with all aspects of our stay - the spectacular sea views, spacious, quiet room, friendly helpful staff, breakfast, cafe/bar, the vast stone public rooms and courtyard. Everything was of an excellent standard. The Parador is perfectly situated for the tourist information office, restaurants and walking around the lovely old streets. It is also a good base for day trips such as to the Guggenheim in Bilbao. This Parador doesn't have a restaurant like others we have stayed in but it is only a minute's walk to some of the best tapis and fresh fish we have ever eaten. 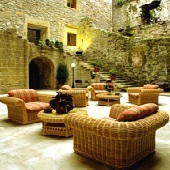 We highly recommend this parador and others in Granada and Carmona. 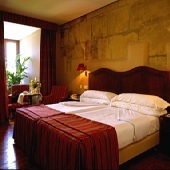 Parador de Hondarribia is in a fortress with views over the Atlantic beaches of nearby France.